Earn up to 4,800 reward points. Small in size, but built to thrill with seven tubes. 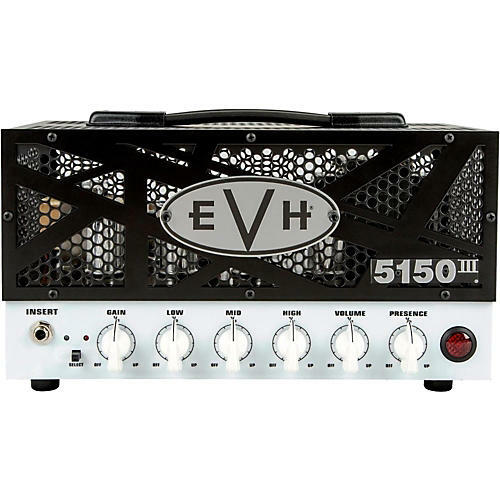 A mighty sonic force to be reckoned with, the EVH 5150III 15W LBX is an easy-to-carry "lunchbox" guitar amp head but don™t let its diminutive size fool you; it's packed to the gills with searing tone. Armed with five ECC83S (12AX7) and two EL84 tubes for incredible high gain sound, it performs like an arena-filling champ. Two flexible channels, the famous EVH Blue "Crunch" and Red "Full Burn," combine with the familiar low/mid/high/presence tone controls and 1/4 power switch so you can easily dial-in your own roaring Variac-less "brown" sound. Dial up a tasty crunch for rhythm work and then when it' time for a face-melting solo, stomp on the included footswitch to call up an intense lead tone with tons of singing sustain. For colossal tone and serious crunch in a compact package, look no further than the EVH 5150III 15W LBX.